Barack Obama and Hillary Clinton on "60 Minutes"
Just days after rescuing Obama on issues such as the fiscal cliff and gun control, Joe Biden must be worrying what it takes to get some loyalty around the White House. 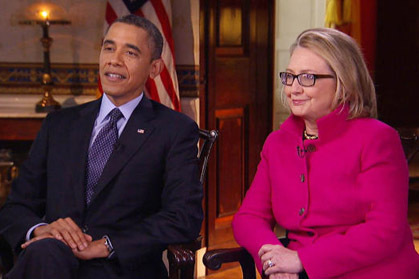 There was Barack on Sunday night on ‘60 minutes’ schmoozing with Hillary Clinton like two best friends forever and not a mention of Joe, good, bad or indifferent. Barack does not do loyalty as one leading journalist recently remarked to this column. He must know that Irish Joe is gearing up for a run in 2016 and that Hillary is likely his biggest rival. So there he was on the nation’s most popular news program offering a hosannah of praises to his former bitter rival. Barack may have knocked back the idea in the ‘60 Minutes’ interview that such political considerations were important, but do you believe him or his lying eyes? Everything is about the future election in Washington and Biden might have expected a little more loyalty after his herculean efforts to salvage the fiscal cliff talks and take the heat on gun control -- a joint appearance on ‘60 Minutes perhaps? No doubt Joe’s hair plugs were on fire as Hill and Barack cozied up instead like an old married couple who had lots of tiffs and made it through despite that. Despite all the good cheer there is no love lost now or ever between the Clintons and the Obamas. The scars of the bitter 2008 primary campaign will never heal. Their political marriage worked out very well for both. Obama got a magnificent and workaholic Secretary of State and Clinton got the high profile and relevance that would have been denied her after her stunning primary defeat. Obama’s tacit endorsement in 2016 will be critical to who wins the Democratic nomination and he seems comfortable for now embracing both his Vice President and his soon-to-be former Secretary of State. But there will come a day either publicly or privately where the Obama endorsement will make a major difference in the 2016 battle. It may not go to Biden or Hillary, it could go to Andrew Cuomo or Martin O’Malley, but I’m sure Biden felt he is entitled to it as the ultimate loyal foot soldier for a president who desperately needs his genuine warmth and political gifts such as working with the opposition. But the Hillary joint interview showed if you need friends in D.C., get a dog, especially when it comes to Barack Obama.